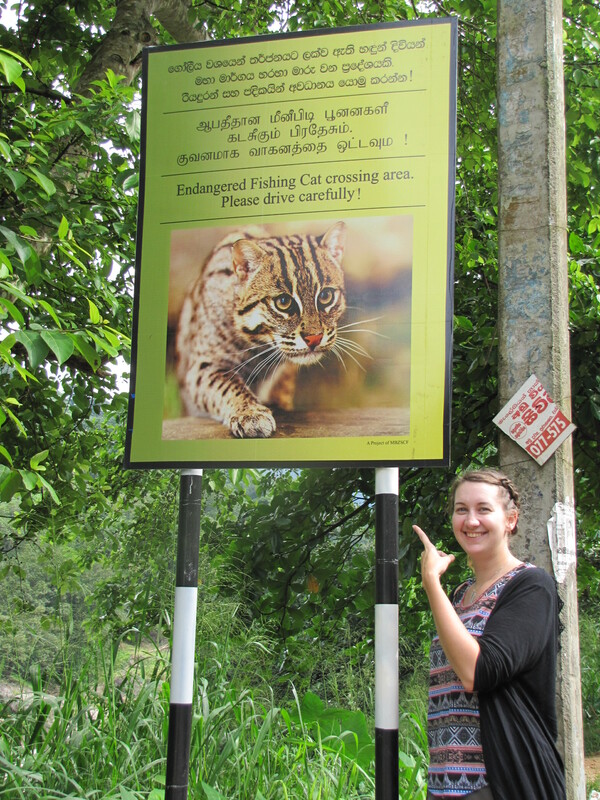 My objective whilst in Sri Lanka was to learn vital field skills and to, hopefully, contribute to the conservation of fishing cats. I didn’t fly for over 12 hours, enduring a screaming spawn of Satan, just on a jolly. I hadn’t planned on any travelling around the island either, which was a shame, but my budget was tight and gallivanting off on your own is expensive, even out here. That’s not to mention the massively differential tariffs in force.If you’re a foreigner you get charged over 10 times as much as the locals, and my blinding un-tannable skin prevented me from even attempting to blend in. I first encountered this when I visited the zoo with Anya; Anya was charged about 100rupees for entry while I got charged 1500. (Before you say it, yes I’m well aware 1500 is not 10 times as much as 100!) You can’t argue though, the pricing is official: it’s up on a sign in black and white.Therefore my initial plan for my weekends was to restrict my excursions to only around Colombo, or to work on the cat data. After the cat conference, Anya had to spend days working out budgets and writing funding proposals, which left me rather at a loose end. Jim Sanderson had planned to stay an extra few days in Sri Lanka, and was going to be visiting the hill country to see some of the fantastic work Ashan was doing with the fishing cats up there. When they kindly asked if I’d like to join them my response was ‘Hell, yes!’. Travelling and sight-seeing revolving around cats; what could be better? It was an early 5am start and we headed for my first-ever Sri Lankan train journey. Ashan had booked our tickets which made things much quicker and easier–no queuing in three different lines only to be told you’re still in the wrong queue! After some slightly directionless wandering, we eventually found the correct platform with, hopefully, the correct train;then it was just a matter of finding the right carriage. After some seat numbering confusion on the part of some Sri Lankan guys, we eventually got to our seats. The train was adorable–it looked like something from the 1920’s–which might have been true, as I was told the railway infrastructure had hardly changed since the British stuck their little flag in the country, claimed it as their own, and then brought everything over to duplicate England. Trains have the ability to put me to sleep within about 10 minutes, so it was by some kind of miracle that I was able to stay awake for the entire 3-hour journey. I was so glad I did, because the scenery was stunning as we made our way up the hills towards Kandy. The humidity noticeably dropped as the size of the hills increased. At various intervals people appeared on the train shouting (true Sri Lankan style) and selling an array of marvellous snacks –it was great.I just wished train journeys back home were a bit more like these; it would make a welcome change from paying a fortune for the most disappointing and predictable limp sandwiches. Back in 2014 I stupidly decided to organise and participate in a 5km sponsored swim. It was the toughest thing I’d ever trained for (I managed to damage my right elbow and shoulder in the process) but it was worth it, because the money raised was going to fishing cat conservation. In fact it was headed to Ashan’s project. It was incredibly bizarre to think that I would actually be visiting a project I’d read about online, seen progress reports posted on Facebook and had helped to raise funds for. After arriving in Kandy we wound our way further up into the hills to see some of Ashan’s awareness work. 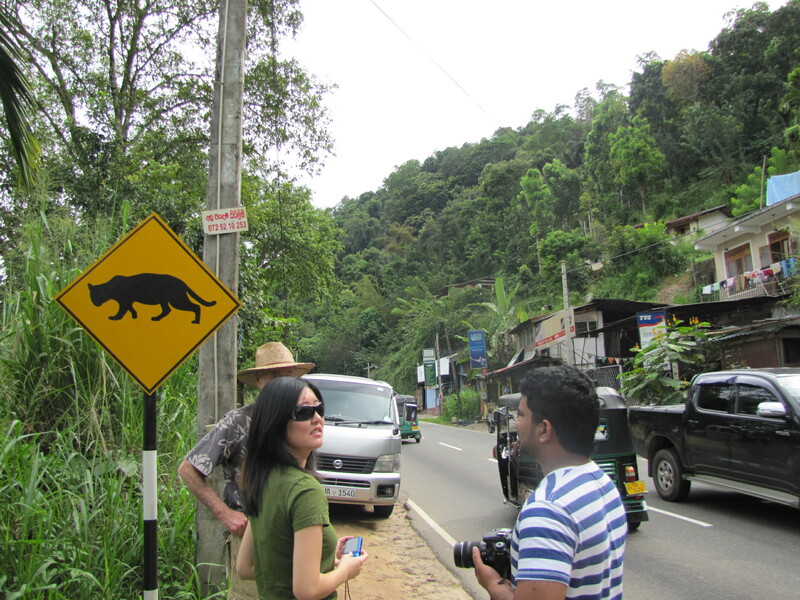 One of the main dangers fishing cats face in the Kandy district is from cars. The speed at which some people zoom along the main roads results in cats becoming roadkill. 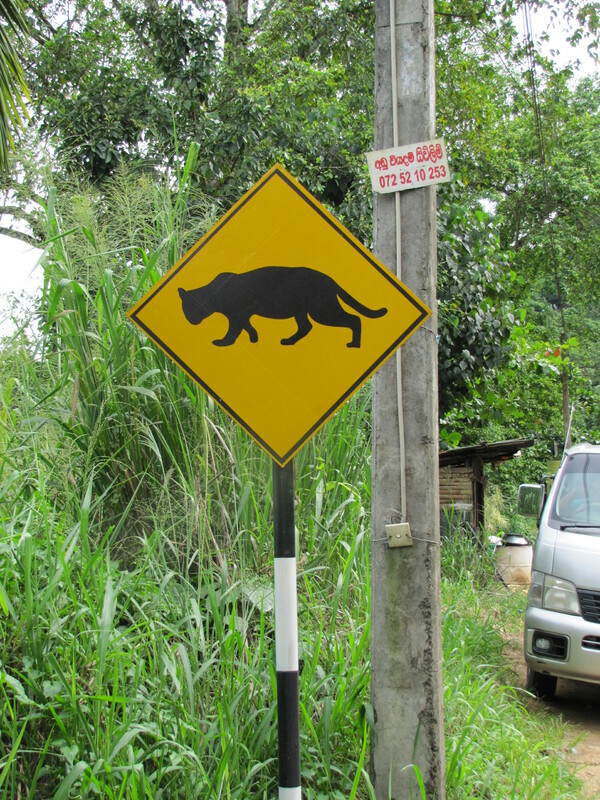 The roads cut into the hillside are quite narrow and traffic is heavy, two factors which seriously reduce any chance of motorists swerving to avoid a cat in their path.In an attempt to at least bring the speed of the traffic down,fishing cat warning signs were designed and erected on these roads. It is the same ideaas the wildlife warning signs in the UK.I couldn’t believe it when I caught a glimpse of the first sign–it was so surreal. For some odd reason I was really proud, not for myself, but for all the people that had worked tirelessly for an animal that is overlooked by so many. It was time to geek out and take pictures like the best Japanese tourist. 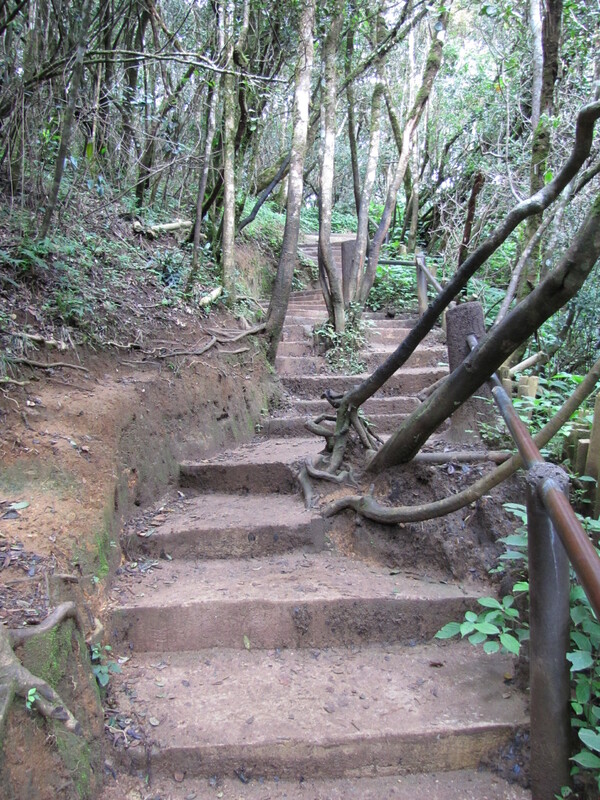 The next day was planned to be touristy with a trip to Nuwara Eilya and Horton Plains National Park. This would be a six hour round trip, so once again it was an early start, 6am. 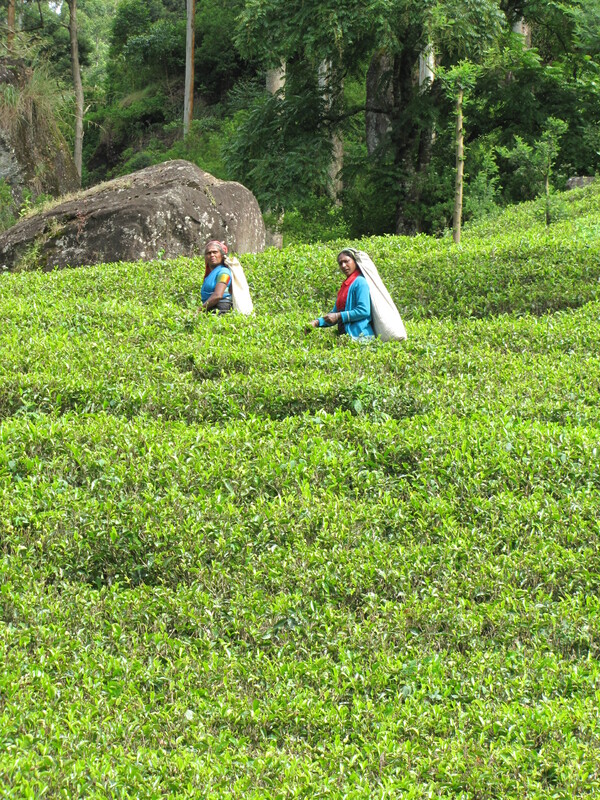 Nuwara Eilya has the coolest climate in Sri Lanka and is considered the most important area for tea production; it came as no surprise to learn that it is also known as Little England. I didn’t think Sri Lanka could get any prettier, but as we made our way even further up the hills I gazed upon a lush vastness of plants interspersed with waterfalls. The roads were narrow and windy with frequent sharp bends; you could imagine it being the sort of road chosen by the Top Gear team to zoom some fancy sports cars around. The locals must’ve been filming their own episode of the programme in their heads, judging from the speed they came tearing around the corners. About 15 minutes before we arrived at the world-famous Mackwoods Labookellie Tea Estate, we came upon a marathon. I couldn’t believe it. There were kids, maybe 15 years old,running barefoot up the hillside in shorts and running vests. I felt so lazy sitting in my cushy seat driving past them. They definitely made them tough out here, but bat-crap crazy too! What was really nice though was the community spirit. People from all up the hillside had come out to watch the runners as they went past, and some even ran beside them a short way to give them a drink or to pour water on them. 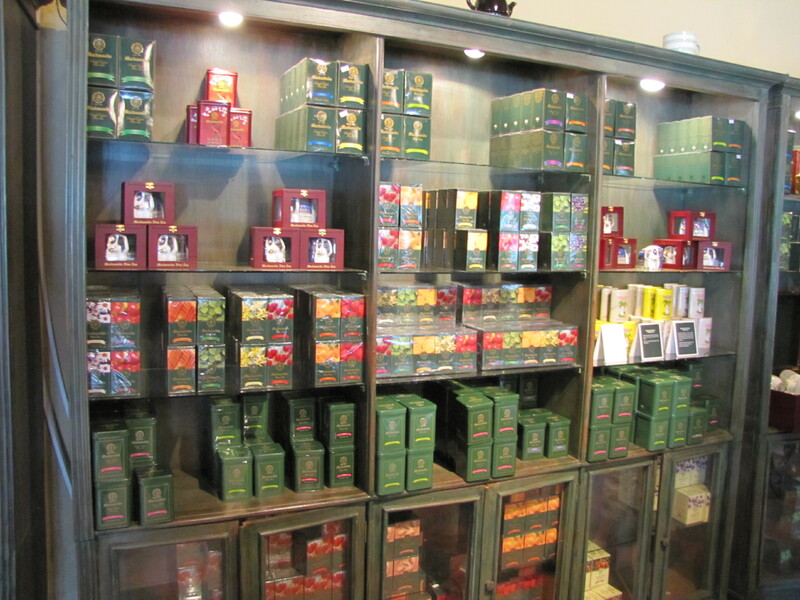 We drove through some of the vast tea estate and arrived at the official Mackwoods Tea Centre. As we entered the carpark we all cracked up, it seemed as if we’d arrived in the Sri Lankan version of Hollywood. 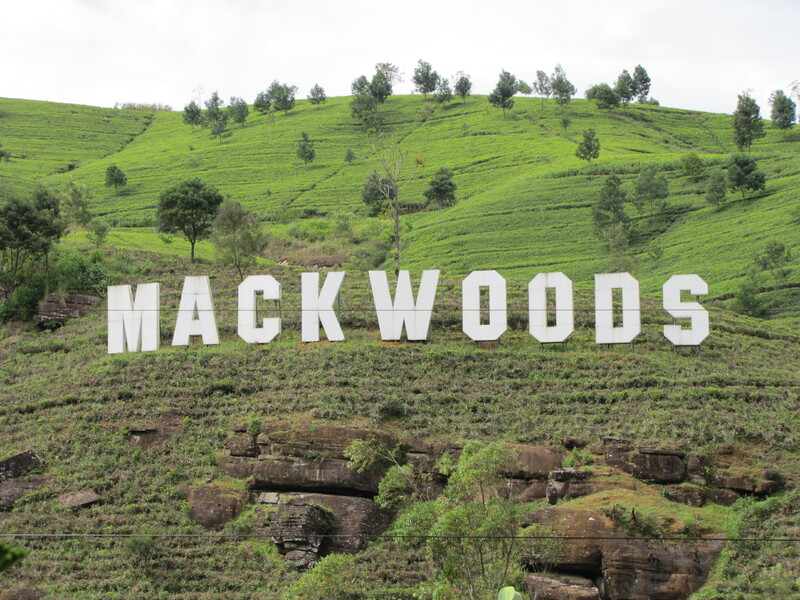 On the opposite hillside –in enormous white letters– was the word ‘MACKWOODS’. The amount and type of tea available was extensive. I had a long list of people from home that had requested me to bring back ‘proper’ tea. Unfortunately all the individual boxes were too large, 500g+, there was no way I’d be able to squeeze 15 boxes that size in my already-strained and decrepit backpack. I’d have to ‘tea’ shop somewhere else. After 6 weeks in Sri Lanka I still hadn’t had a good cup of proper tea. I’d been served some of the most revolting tea which I had to drink out of politeness. It has basically been warm, sugary milk which has seen a tea bag. I discovered why they serve it in this manner and the reason is because, ironically, out here milk is cheaper than tea. Unimaginable in a country where it is grown by the ton. As for the amount of sugar, they just love it –even more than I do. I’ve since learnt to ask for plain tea, it still comes with a mountain of sugar but at least it’s more palatable than the milky abomination. 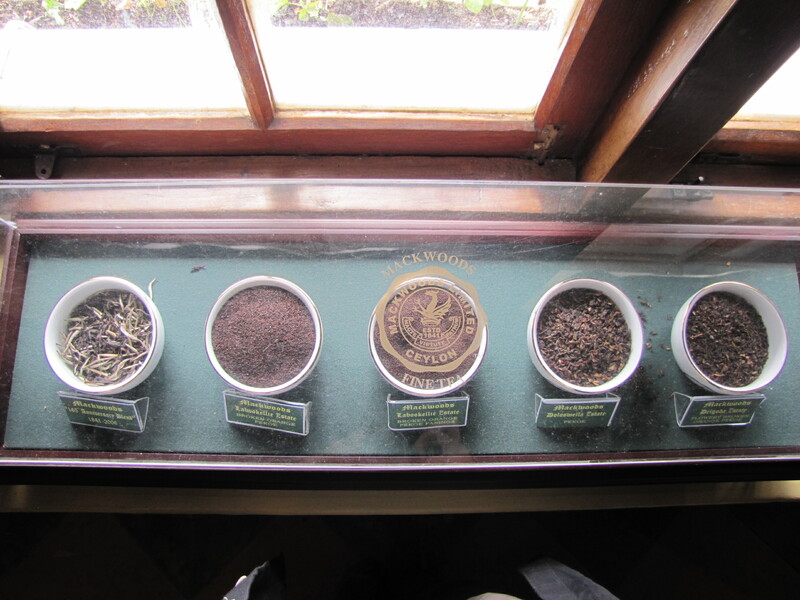 Today I would be having tea made at a tea plantation. I had high hopes. 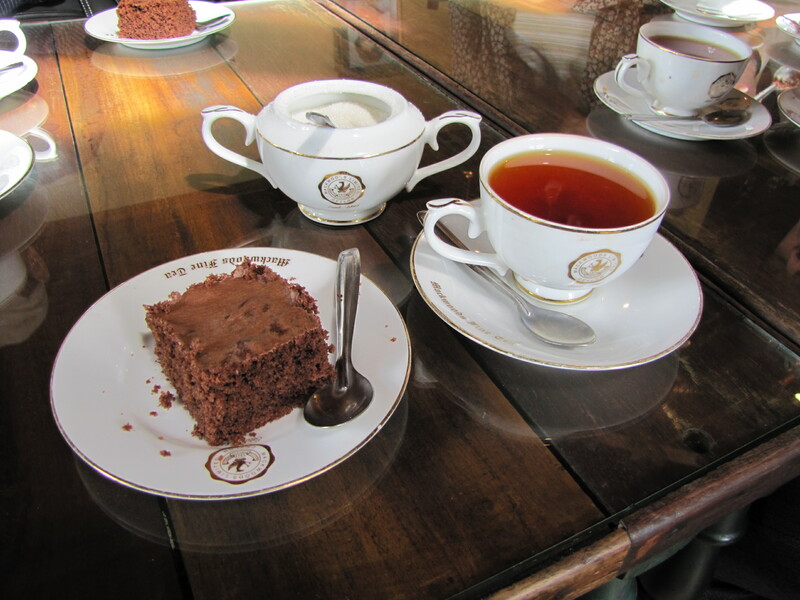 I wasn’t disappointed, the tea was delicious and cake was served with it too. I was definitely in a very British happy place. 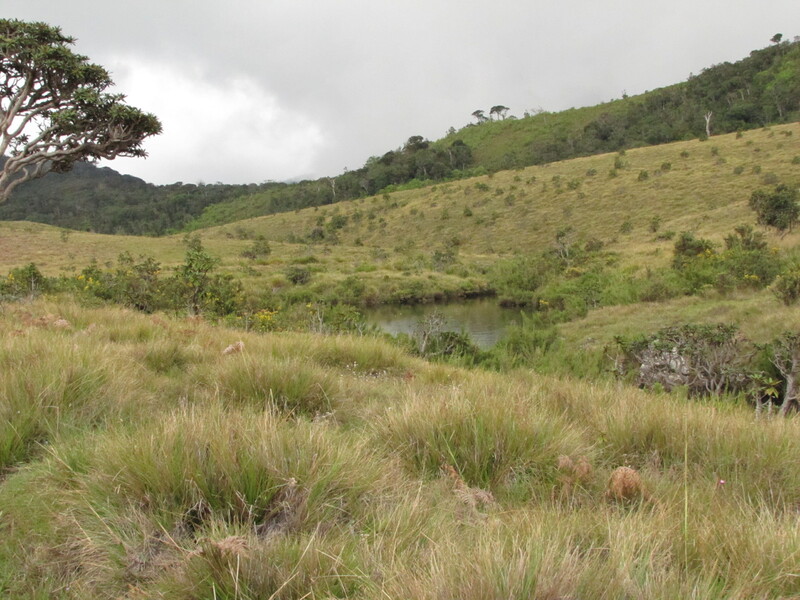 After our mini-tea party, we drove to Horton Plains National Park which consisted mainly of high-altitude grasslands and rocky outcrops. 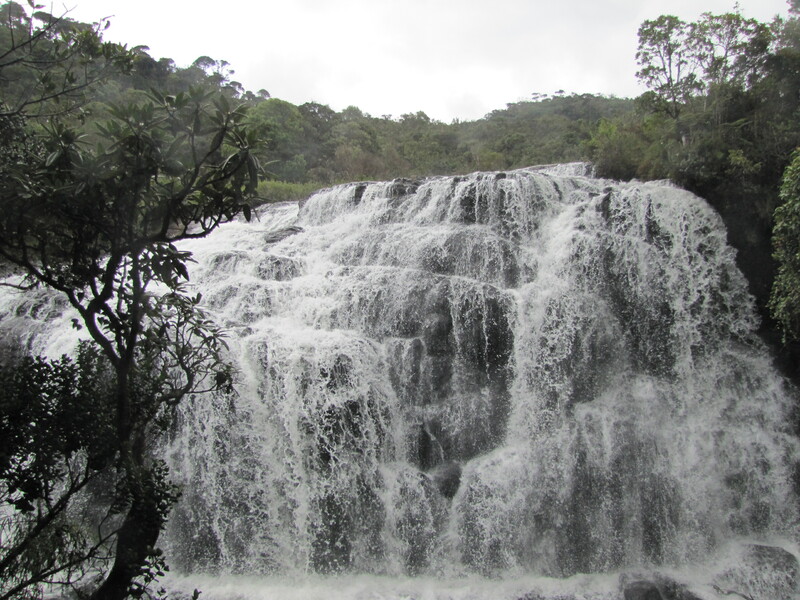 Due to time constraints–it was a long drive back to our base– we decided on just a short 6km round walk to see Baker’s Falls. The path was very rugged and filled with large boulders. It was a fun walk but you couldn’t really take your eyes off the path for fear of breaking an ankle, so it was quite difficult to look out for animals. Surprisingly, I noticed a shrub that looked remarkably like Scottish gorse. After a few moments, I came across an information sign explaining that the Scots had brought the plant over to remind them of home. I know Scots are tough, but why would anyone choose to bring the country’s angriest, most painful plant with them? Why not some heather? Once again the British were to blame for importing an invasive species that was causing havoc. The path down to the falls was beautifully cut around the trees; it was nice to see that someone had remembered they were there first. Although only 20m high the falls were impressive, coming down in wide sprawling cascades, but time was swiftly running out so we had to turn back almost as soon as we got there.At that very moment it decided to start chucking it down, this shouldn’t really have been a surprise as we were so close to ‘Little England’. 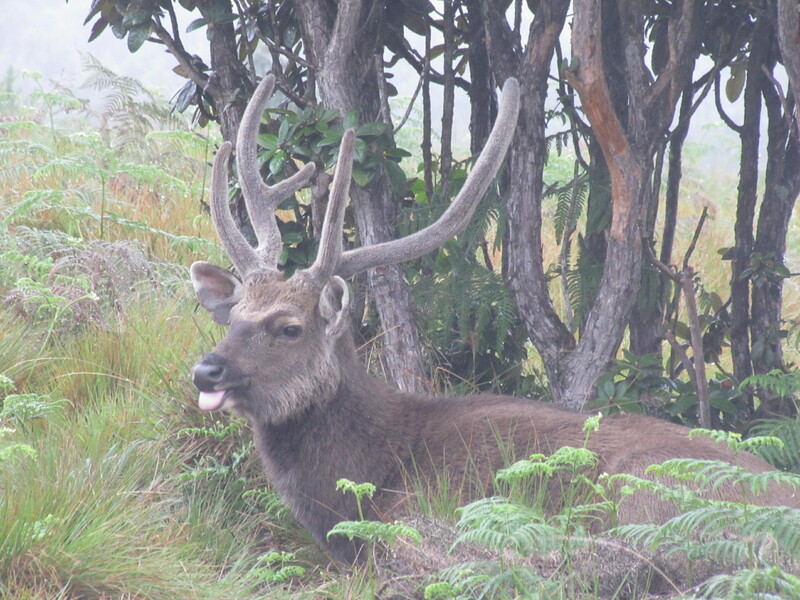 As our short time in Horton Plains came to an end, we finally got to encounter some wildlife, some wild sambar deer.